WHAT IN THE WORLD IS THAT?? The Youabian Puma of course! 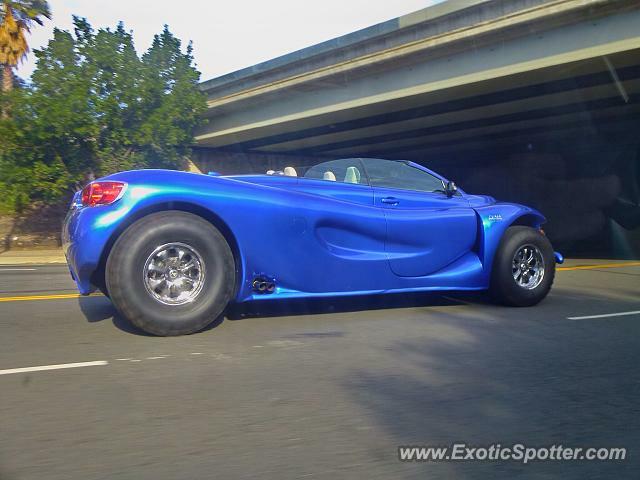 One of the most unusual cars you will ever see in your life! I spotted this wild animal in the wild on Ventura Blvd and could not believe how massive this thing was. Designed by an Armenian plastic surgeon from Beverly Hills,this is definitely something that stands out. It has a corvette engine, HUGE 44 inch rear tires and a staggering $1.1 MILLION price tag!! Only 20 will be produced every year from what I heard. Unbelievable! Mahmoud, one is more than enough of this ugly blue turd. I said it before and I will say it again, the designer of this atrocity was doing some seriooous drugs when he hit the drawing board....... I regret ever seeing this! Horrible to know they will make 20 every year, why not work backwards? 20 this year... 19 next year and so on until extinction? Or simply say 20 is enough for planet earth. BUT on rarity I will congratulate you on spotting this horrendous piece of machinery. Thanks Cool. If or when your in Colorado, I recommend going to Stevinson Imports, the have a 918, a few brand new GT3rs and way more! No @carguyjt no it was in Cali. It was an awesome place. Filled with bentleys and ferraris. It was so sick. Where did you see it, was it in Colorado? OMG I saw this thing but it was at an exotic car rental place (you can't rent this) so I couldn't post a picture. WHO in their right minds would buy this??????????? right, which is not that surprising despite the amount of criticism on the looks of this car. "Only 20 will be produced every year from what I heard. Unbelievable!" But none have been sold yet, right? The designer should be sued for this. I just hurt my eyes! I wanna see one, just for the experience. I don't think I'll be able to fathom how massive it is until I see it in person. I still don't understand what is going on with the design of this vehicle. I know right! It is technically a once in a blue moon chance to see something like this! But its good that you took these shots, for history's sake. Exactly Jafo! Besides that, whoever wants to buy it will buy it since it's their personal choice. It's funny how the designer tried to sue people for calling his car ugly! Remember that story guys? Nice find and shots, but its good to hear the world only gets 20 of these, its irrelevant. Lamborarri said it best about this thing.